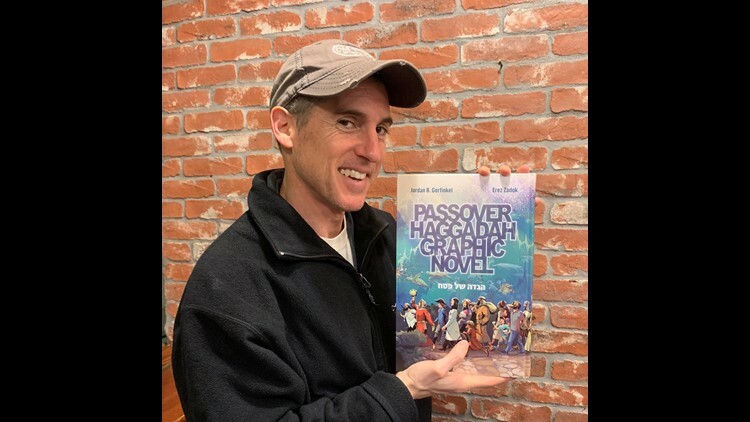 The Passover Haggadah Graphic Novel integrates a brand-new translation directly into the art, immersing every generation in the timeless celebration of Passover. SAN DIEGO — Jordan Gorfinkel (aka “Gorf”) is a cartoonist, musician, producer, director and proud father, not necessarily in that order. Gorf is the creator, writer, producer of Passover Haggadah Graphic Novel. The full-length narrative art version of the traditional Passover Seder table guide book engages people of all backgrounds and faiths in the universal stories and rituals of slavery and freedom. The Passover Haggadah Graphic Novel integrates a brand-new translation directly into the art, immersing every generation in the timeless celebration of Passover. The graphic novel pages are presented alongside the complete Seder text, in Hebrew and transliteration, and accompanied by instructional cartoons depicting all of the rituals. For nearly a decade, Jordan Gorf managed a team of writers, artists and creators on the Batman franchise for DC Comics, producing more than 2000 stories in multiple mediums. Gorf’s creations, such as Batman: No Man’s Land and Birds Of Prey, have resulted in critically acclaimed and commercially successful publications (Birds Of Prey, the most successful female superhero team franchise in history), film (Birds Of Prey, The Dark Knight Rises), television series (FOX, Cartoon Network, the WB and the CW), games, merchandise and more. He's on a book tour and is in town to visit a San Diego synagogue. He spoke with Morning Extra about the relationship between comics, superheros and faith.